I couldn't resist this top from Target I found earlier this Summer. I mean, pink flamingos? Well played Target! I also bought Jon the men's flamingo shirt so we could match. We've yet to take a picture together #twinning. I need to change that. I digress... I really do love the color mint because it's so versatile and by Spring I'm always ready to burst out this pretty pastel color for the warmer months. The color combinations are also endless. I paired this dress many moons ago with mint for a wedding last year and I was obsessed. Mint + lavender = lovely! What's your favorite color to pair with mint? Doesn't Jana just look darling with her gorgeous polka dots and mint cardigan? I'm going to be recreating Rebekah's outfit with my mint converses for a day of running errands. I can't wait to see what y'all come up with for "METALLICS". Get creative - this doesn't have to necessarily be a clothing item. Think shoes, nail polish, jewelry, etc. 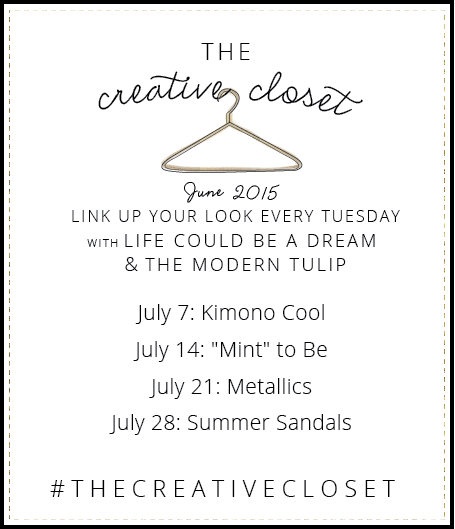 16 comments on "The Creative Closet || "Mint" To Be"
Oh my goodness that shirt--the flamingos are just too cute! And I love that you bought your husband a flamingo shirt too--how cute are you two?! This is such a cute, relaxed summer look, I love it! ahh, LOVE that first picture of you! You look great!! You are looking hot little momma! your HAIR!! oh and the shirt, shorts, and slip on's too. LOVE this look - definitely copying for this weekend at the beach! I love the top tied + the belt, such a fun twist on the look! Mint to be fab, lady!! 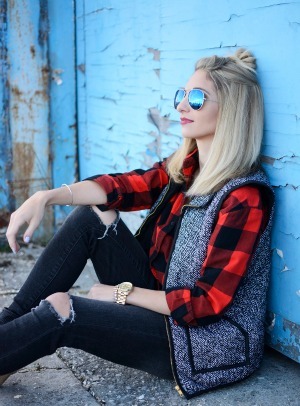 Super cute casual look! I love how you styled it up by tying the shirt and that cute belt! Beautiful look! I love mint! You are adorable in this getup. It is sporty yet preppy, girly and fun. I must have that beautiful flamingo button-down. We were both thinking button-downs in our "Mint to be" looks this week. Check mine out. How cute is that shirt?! You've got this whole cool-mom-on-the-go thing down pat!